Greek voters have overwhelmingly rejected a demand by the country's lenders to impose more austerity measures on them in exchange for new bailout loans for the government in Athens. With 87 percent of the votes counted from Sunday's referendum, more than 60 percent of voters have rebuffed warnings from European leaders that ignoring their calls for more austerity could force the country from the 19-nation euro currency bloc. 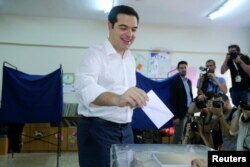 Prime Minister Alexis Tsipras, who had urged a "no" vote said after the polling, "Today we celebrate the victory of democracy." Greek Prime Minister Alexis Tsipras votes at a polling station in Athens, July 5, 2015. The scale of the victory is seen as an emphatic vote of confidence in Tsipras. In a televised address after early results were announced he thanked voters for making “a generous choice.” “However, I'm fully conscious that the mandate you have given me is not a mandate against Europe, but a mandate to find a sustainable solution with Europe that will take us out of the vicious cycle of austerity,” added he. The opposition accused Tsipras of jeopardizing the country's membership in the 19-nation club that uses the euro. Greek opposition leader Antonis Samaras announced his resignation, after his New Democracy party had urged a 'yes' vote in the referendum. Whether the creditors will be willing to pull back on their austerity demands and approve more bailout money for Greece is far from certain. As Athens defaulted on a $1.8 billion loan payment due the IMF last week, European leaders said a negative vote would signal that Greece wants to leave the eurozone and divorce itself politically from Europe. Thousands of Greeks gathered in Athens' main square Sunday night to cheer the apparent outcome of the referendum, with many chanting "No, no!" Nearly 10 million people were registered to vote in the referendum and officials said more than half that number may actually have voted. The European Commission says it "respects" the result of the Greece referendum, after Greek voters on Sunday overwhelmingly rejected the terms of a bailout. European Council President Donald Tusk called a summit of eurozone leaders for Tuesday to discuss the situation. German Chancellor Angela Merkel and French President Francois Hollande spoke to each other Sunday night and agreed "that the vote of the Greek people must be respected,'' Merkel's office said. Prime Minister Alexis Tsipras has "torn down the last bridges, across which Europe and Greece could move toward a compromise,'' Gabriel told the daily Tagesspiegel. Greeks will get a first idea of Europe’s response to their rejection of austerity measures Monday morning – when the European Central Bank will meet to decide whether to continue propping up Greek banks. 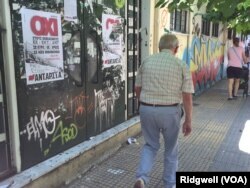 Athens pensioner Nikos Minas said Greeks had defied the warnings from Brussels. Among the ‘No’ supporters, there was a sense of surprise at the apparent scale of their victory - and relief that five-years of austerity may be coming to an end. But for Athens student Panagiotis Giannopoulos there also is a sense of the unknown over what happens when the party ends. That is exactly the warning Brussels officials had given Greece before the vote. Greek Finance Minister Yanis Varoufakis, who had warned he would resign from the government Monday if his countrymen voted in favor of accepting the austerity demands, called the vote "a holy moment." "The massive failures of the eurogroup were leading to ultimatums for which the Greek people had no say," Varoufakis said after voting. "Today, after five years of failure, the Greek people have the opportunity to decide on the last ultimatum of the eurogroup, the institutions and our partners. This is about a holy moment. A moment of hope for the whole of Europe - a moment that gives hope to Europe that the common currency and democracy can co-exist, and they co-exist." A woman voter said she was undecided until the last minute. She has two small children and is anxious about the future. “Though I am determined to make even more sacrifices for Greece to get over the crisis and have a better quality of life,” she says. A man walks past a "No" campaign poster during a referendum in central Athens, Greece, July 5, 2015. Finance Minister Varoufakis had even accused the EU of "terrorism" by trying to scare the Greeks into voting their way. 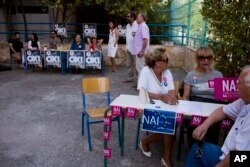 Supporters of "yes," right, and of "no," left, wait for voters arriving in a polling station in Athens, July 5, 2015. But those in the "yes" camp said Greece has no choice but a European future. Being forced out of the eurozone means Greece would have to go back to using the old currency, the drachma - money that some outside Greece could refuse to accept. Ken Bredemeier and Smita Nordwall contributed to this report.